At the moment, there are not a lot of Australian distilleries whose gins are available in the UK; one is Four Pillars, and the other is West Winds. Sabre (40.0% ABV) – Described as an “Australian expression of a traditional gin”, this is made with botanicals including juniper, lime peel, lemon myrtle and wattle seed. Cutlass (50.0% ABV) – West Winds’ second gin is described as a gin with “Australian character and a combination of juniper and uniquely Australian elements”. Its botanicals include cinnamon, myrtle, lemon myrtle, coriander, and Australian bush tomato. Nose: Bright and zesty citrus, with notes of coriander and hints of vanilla spice, as well as citrus blossom. Taste: Lots and lots of citrus: lemon, lime, and others, with coriander and a note of menthol pepper towards the end. This has a good flavour that’s contemporary, intense, and long-lasting. Fruity and juicy with a luscious vibrancy that makes this very refreshing. There are notes of dry juniper and angelica, especially at the end. This is a pleasant cooler that I could sip all afternoon. Rich and fruity with floral notes, too, as well as a touch of grape, light, sweet spice, and bright, zesty citrus. There’s no need for a garnish in this Martini. A floral, slightly juicy Negroni with plenty of citrus that makes it fresh, bright, and refreshing. There are some lovely light, sweet berry notes, too. Nose: Less citrus, but more spice. Notes of dark chocolate and lime combine into notes of chocolate limes. Taste: Lots of citrus towards the end. This is typically more gin-like than West Winds Sabre, with more juniper and angelica, and some coriander, too. The finish is then vibrant with notes of citrus sherbet and milk chocolate. Bright and brilliant – full of zesty citrus, which invigorates the drink. This would make a great first G&T of the evening, with the 50.0% ABV adding a little punch. Very smooth, and with lots of citrus, with notes of coriander, lemon, and lime. This also has a lovely texture; fresh, with hints of juniper and spice on the finish. This makes a smooth and thick Negroni with a good level of flavour: bitter herbal notes and bright citrus, making for an intense and delicious cocktail. It is fair to say that both of the West Winds gins are fine examples from the growing community of international gin distilleries and the increasing number of Australian craft distillers. I like the straightforward nature and flavour intensity of the Sabre, which is a great gin for everyday drinking, and the Cutlass has additional complexity and a bright, more contemporary flavour. I was impressed with both gins from West Winds and the approach to have two different gins in a portfolio. I especially enjoyed the Cutlass Gin & Tonic and the Sabre Martini. Today’s gin is made by Great Northern Distillery in Middle Swan, Western Australia, which is primarily a rum distillery. Their website suggests that their gin recipe comes from a scribbled note on the back of an old family birth certificate. Released on 29th May 2014, the gin is bottled at 37.1% ABV and, as such, it cannot legally be sold as a “gin” in the European Union or United States (where there are minimum strengths of 37.5% ABV and 40.0% ABV, respectively). Nose: Pine and spice. Light, but with a depth that is initially hidden. Taste: This has a notably full mouthfeel: plump and interesting. The flavour profile is light, but the flavours build: there is coriander upfront, as well as some creamy vanilla and a touch of spice, followed by a dry finish. Quite light, but, with plenty of lemon and ice, this makes a refreshing drink. Nonetheless, I would have liked a little more of the gin’s character to come through. Very clean and vodka-like, this cocktail is a little lacking in complexity and flavour, making it a tad disappointing. It is a pleasant drink, but not a great Gin Martini. Fresh, leafy, and crisp, with plenty of sweetness from the vermouth and bitterness from the Campari. This is a lighter-than-usual Negroni, which would make it a perfect example for beginners to the drink. Dead Governors Gin is a lighter option, both in terms of flavour intensity and ABV. I liked the Negroni and the spirit itself had a good mouthfeel, although it lacks the complexity to be sipped alone. Great Southern Dry Gin is produced by the Great Southern Distilling Company in Albany, Western Australia. Bottled at 40.0% ABV, its botanicals include: juniper, coriander, angelica, fresh lemon, orris, cardamom, cinnamon, anise, and bloodroot. It is also based on the distillery’s voda, which is distilled from grapes. Nose: Juniper, coriander, and a little citrus with just a touch of woodiness, too. Taste: This is a good spirit with sweet spice notes and a light fruitiness, before a dry finish with notes of vanilla and orris. Dry, with notes of spice, especially cinnamon and cardamom, and some floral citrus. This is particularly easy to drink (very quaffable) with a clean, dry finish. Clean and smooth, but without a huge amount of flavour or character. There are some light floral and spiced notes, including cinnamon. This is a relatively light Negroni, with a little juniper and angelica, but it’s the sweet vermouth and the Campari that really shine through in this cocktail. The Great Southern Dry Gin is a complex and fragrant gin with some versatility in mixed drinks. My favourite was the “I’ll take another” Gin & Tonic. Made by Great Southern Distillery of Albany, Western Australia, this is based on the grape-based Great Southern Dry Gin, which is made using a blend of nine botanicals: juniper, coriander, angelica, lemon, orris, cardamom, cinnamon, anise and meen (bloodroot). It is then aged in French oak barriques. Nose: Citrus, angelica, and coriander, with a little dry spice, too. Vanilla, pepper, and a touch of black tea. Taste: Viscous and oily, the initial, classic flavors of this gin – juniper, angelica, and citrus – move onto the sweeter, woody flavors of vanilla, nutmeg, and cinnamon. However, the flavors then move back to a long, dry finish of juniper and citrus. Today, I’m looking at another sample kindly provided by James. I haven’t been able to find out very much about this gin from the Melbourne Gin Co.; even in Australia, it is illusive. What I do know is that it is bottled at 42.0% ABV and each of its botanicals are distilled separately. These include: juniper, coriander, angelica, orris, cassia, macadamia, sandalwood, honey lemon myrtle, organic navel orange. After distillation, the gin is proofed with Gembrook rainwater. Nose: Light, with citrus notes and a touch of piney juniper. Taste: Smooth and light with lots of citrus. Easy to sip, the juniper in this is relatively dialled back. Accessible and easy to drink neat, I would say that this is a good, entry-level gin. This makes quite a light Gin & Tonic that is simple, but tasty, and relatively refreshing, with lots of woody, earthy angelica. I would recommend using a light-touch tonic water. A clean, but very straight-forward Martini: smooth, with clear notes of vanilla and citrus. This is pleasant and drinkable, but nothing special. A solid Negroni with notes of citrus, pine, and angelica, followed by a little more juicy citrus and a bitter finish. Middle-of-the-road, but good. The Melbourne Gin Co. Gin is a well-made gin in the style of the lighter, contemporary gins. It made a solid and enjoyable Negroni, which was my clear favourite of the drinks that I tried. 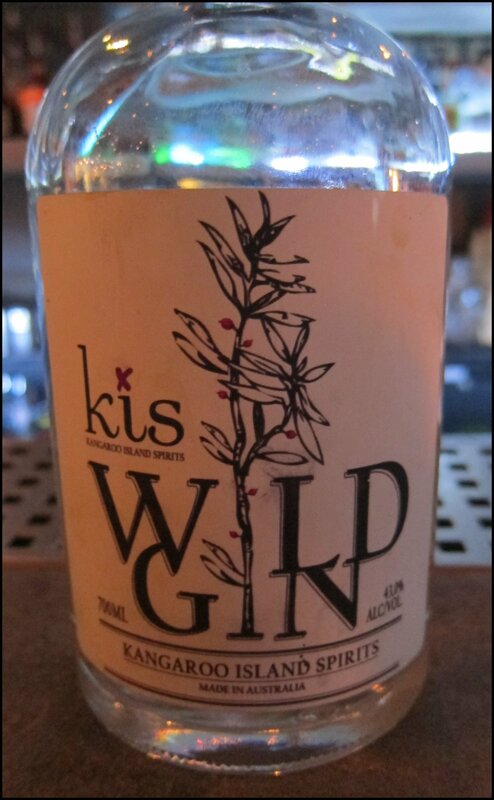 KIS Wild Gin is made by Kangaroo Island Spirits in South Australia and is one of four gins produced by the distillery. The Wild Gin uses a different juniper berry to the usual Juniperus Communis; namely, the native “Myoporum Insulars” aka Common Bobbialla or Blueberry Tree. These berries are slightly larger than those of Communis. Nose: Lemon shortbread, coriander, vanilla, and cream, as well as bright, zesty lime. Taste: This is a smooth spirit with plenty of flavour: there is a pleasant smokiness upfront with some savoury, salty spice, as well as a touch of resin. Fresh and bright with a good level of flavour and balance. Good notes of cardamom and a cavalcade of spice: vanilla, cinnamon, ginger, and coriander, followed by juniper and citrus. The finish is dry and zesty with a touch of wood smoke. Lime bursts forward to start, alongside a smoked spice – think paprika, but a tad sweeter. There are also notes of cinnamon, anise, and cardamom. All-in-all, this is a complex drink with a really great silky texture – delightful. KIS Wild Gin makes a tremendous Negroni that is packed full of lime zest and creamy vanilla, plus a chord of spice – ginger, cinnamon, and cardamom – that works well alongside the Campari and vermouth. Finally, there is a long, mid-bitter finish. Kangaroo Island Spirits’ Wild Gin is a great example of the exciting gins coming out of Australia and how a distillery can put locally-sourced botanicals to good use in their gin. My favourite drink was the Negroni. Larks Tasmanian Godfather Gin is made by the Larks Distillery in Hobart, which was founded in 1992 on the Island of Tasmania. The gin is bottled at 40.0% ABV and includes Tasmanian pepperberry amongst its botanical mix. Nose: Mostly alcohol, with a touch of citrus, vanilla, raisin, and ginger. This is quite a light gin with a little menthol pepper that builds on the finish. There is some light, creamy juniper, as well as notes of coriander and citrus. It is easy to sip, but not especially juniper-forward. A soft Gin & Tonic that is nonetheless very thirst-quenching. The notes of juniper and the other botanicals are light, but still discernable. I think a garnish of lightly crushed Tasmanian pepperberry (failing that grains of paradise, cubeb or black pepper) would work wonders. Smooth and viscous, with a little vanilla, like a cross between a gin and a vodka Martini. It has a creamy finish, with lots of grain notes, and only a touch of juniper and menthol pepper. Quite a soft cocktail, with a bitterness that builds as you sip. Mellow, with earthy herbal notes that are well-integrated, but the gin does not come through boldly. Larks is a good example of the lighter style of gin that appeals to many drinkers and is also accessible to non-gin fans. It struggles a little more against ingredients with stronger flavours, such as Campari, but it is particularly well-suited to light coolers; mixing it with citrus and soda would be a good option.